Brooks Koepka attempts to win the double hit challenge. The new rule changes have sparked a lot of chirping around pro golf. One rule in particular, though, has avoided criticism so far: the double-hit rule. That might change quickly, though, thanks to a video challenge involving Dustin Johnson, Henrik Stenson, Tommy Fleetwood and Brooks Koepka. Originally, if a player struck a ball twice during one shot they would receive a one-shot penalty. But the new rules have done away with that penalty. That change has caused some people to think of ways to proactively use the change to their advantage. 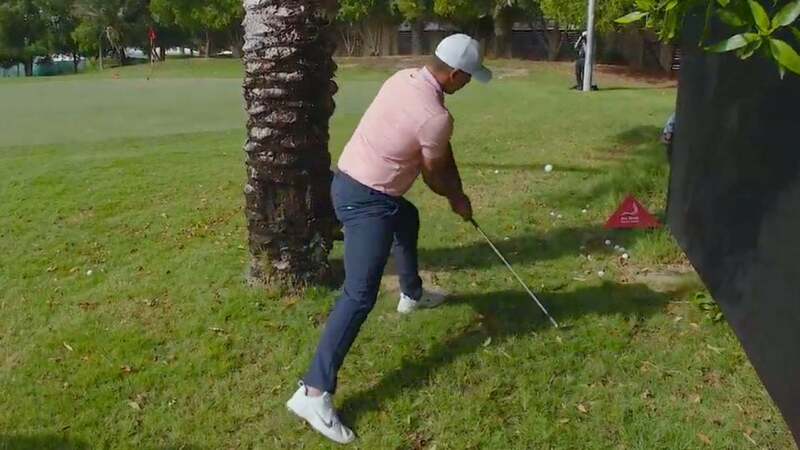 Inspired by one such viral video showing how to game the new double hit rule, the Abu Dhabi HSBC Championship set up a fun contest for some of the top players in the field at this week's event. You can see the original video by Hannah Davis below. https://www.instagram.com/p/BsduCavHRd1/ The pros, which included Johnson, Koepka, Fleetwood and Stenson, were challenged to escape from behind a large tree beside a green with a double hit: first lofting the ball and then swiping it out of midair toward the flag. The closest shot to the pin wins. DJ and Stenson's efforts left something to be desired. Fleetwood's attempt, however, got within 20 feet. Koepka had the last go at it, but he left his ball just outside of Fleetwood's. Check it out below. https://twitter.com/HSBC_Sport/status/1085144562392317957 Unfortunately for these pros and golfers everywhere, this creative double-hit move is not actually legal, despite the changes to the rule. That's because to avoid a penalty, the double hit needs to be accidental. In all these scenarios, the shot is clearly intentional, so don't expect to see any pros attempting this during a tournament like they will when it comes to dropping from knee height and, of course, putting with the pin in. The Abu Dhabi Championship is the first European Tour event of the new year. That means it’s the first time players on that Tour will compete under the rules changes enacted on Jan. 1. Given all the discussion through two tournaments in the States, you can expect to hear some more sniping from the European pros this week.